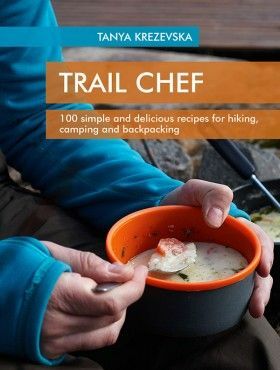 Food might not seem like an important topic when it comes to hiking; grab some snacks and toss them in your pack, right? But food is an extremely important aspect to understand, especially related to hiking, because food is fuel. 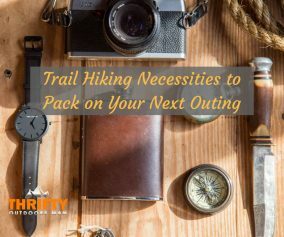 If you plan on hiking up a mountain and only plan on packing a couple of bags of chips then you might run into some problems. Calories in food are energy, literally, and if you don’t have energy you won’t be getting very far. Or if you do get far on poorly chosen food, your body is the one taking the negative hit (like burning up muscles instead of the fuel). So what kind of hiking nutrition do you need? Let’s talk about it. How much food you need to bring depends completely on your specific body type; weight, height, gender and age. You will need to calculate your Basic Metabolic Rate as well as your hiking logistics. Basic Metabolic Rate is determined to see how many calories you burn just by existing. You need to calculate this rate plus the distance that you will be hiking. Add in how much energy you need on a hike getting from Point A to Point B on top of your BMR to give you an estimation of how many calories you need for your trip. Here is a BMR calculator to get you started. This provides the lowest amount of calories that you will need to maintain your health, but going above this number is optimal since you will be burning a lot more than you are taking in, especially on those uphill, rigorous hikes. What to look for in your hiking food choices. Most foods you bring hiking usually consist of a mixture of carbohydrates, fats, and proteins. Carbohydrates are your friend when hiking. They will keep you topped off with energy. It’s important to consider what you eat the days leading up to a big hike (especially multi-day hiking and backpacking). Beer and crackers probably won’t provide the necessary nutrition to get you started on the right foot. Eating lots of well-balanced foods is a good start, as well as consuming 2 liters of non-alcoholic drinks (alcohol is dehydrating) in the days prior to your excursion. When you are hiking, you want to avoid high fat foods because they are harder to digest. 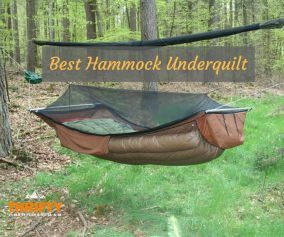 They are a good solution during the night though, if you plan on camping in cold weather because they will keep your body working and provide a little bit of heat. Carbohydrates will be your main source of energy with a balanced amount of protein. 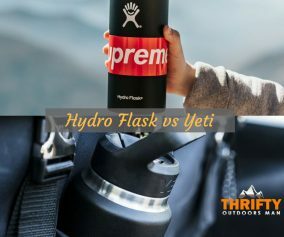 ​On the day of the hike drink a liter of water before you begin (and make sure to void before you head out!). While hiking, try to drink water every 10-20 minutes, even if you aren’t thirsty. It’s also a good idea to make sure that at least half of what you drink has carbohydrates in it, and some form of electrolytes. You will want to look for a mixture of simple and complex carbohydrates and balance those with a side of protein. Snacks to eat on the trail. Nuts, seeds, and nut or seed based bars and nut butter packs. Energy gels, bars, and chews. Freeze dried fruits and veggies. Tuna from a can or pouch (if a can, grab one with the pull-top so that you won’t need a can opener) and crackers or pita bread. The tuna is almost pure protein balanced with the carbs from the bread or crackers. Hard cheeses (that are robust enough to survive on trails) and crackers. Foods that require a lot of prep. 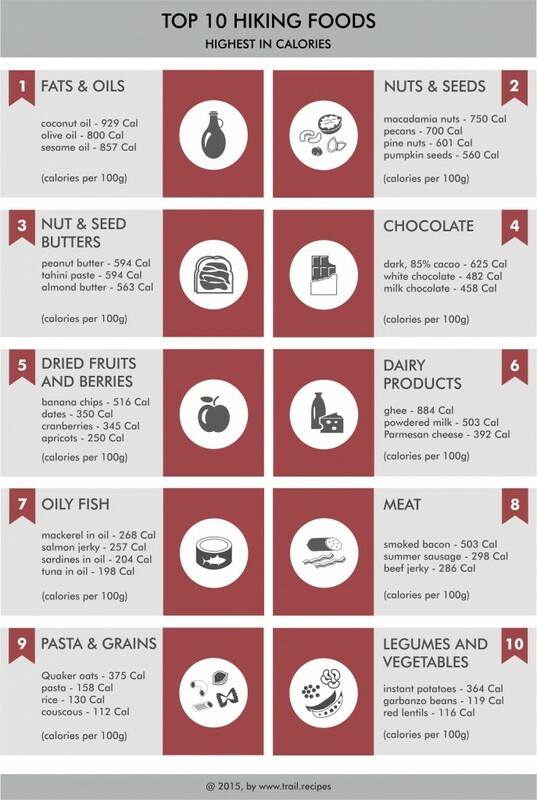 Foods that are heavier to lug around or provide little in the way of energy. Fresh fruit might be a good choice during the normal day-to-day of living a healthy life, but if you are hiking and burning tons of calories, you will want something that is higher energy and higher calories. Foods that are perishable. Foods that are perishable will only be safe to eat for an hour in 90 degree weather, and for 2 hours in milder weather. What about a sugar crash with all of this sugar? Carbohydrates are basically sugar. So how do you avoid a sugar crash when you are supposed to eat sugar all day? The answer is small amounts constantly. When you stuff your face with a bag of Halloween candy at noon and then don’t eat again for 5 hours, then, of course, there will be a sugar crash. But if you eat small amounts all throughout the day during your hike, you will be able to sustain that stream of energy. Another important factor to consider is that there are two types of sugars; simple and complex carbohydrates. Simple carbohydrates are found in things like candy and table sugar. They give a simple boost of energy, break down quickly, and can provide that sugar crash. Complex carbohydrates are found in things like pasta, rice, and other whole grains that provide longer and more sustainable energy because they take longer to break down. Starting a hiking day off with a bowl of oatmeal can provide a lot of complex carbs that will give you a lot of energy from the start. The key is sustaining that by grazing throughout the entire journey. Packing food for hikes isn’t difficult, but it’s something that should be taken into consideration to provide the maximum and safest results for you body. Eat lots of carbs, drink lots of fluids, and keep up your energy. Was this list helpful? Let us know in the comments. 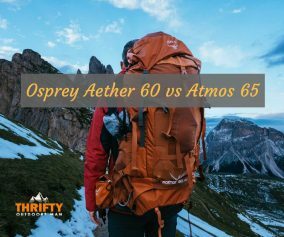 If you enjoyed this article, please share with your friends, family, and fellow hikers! 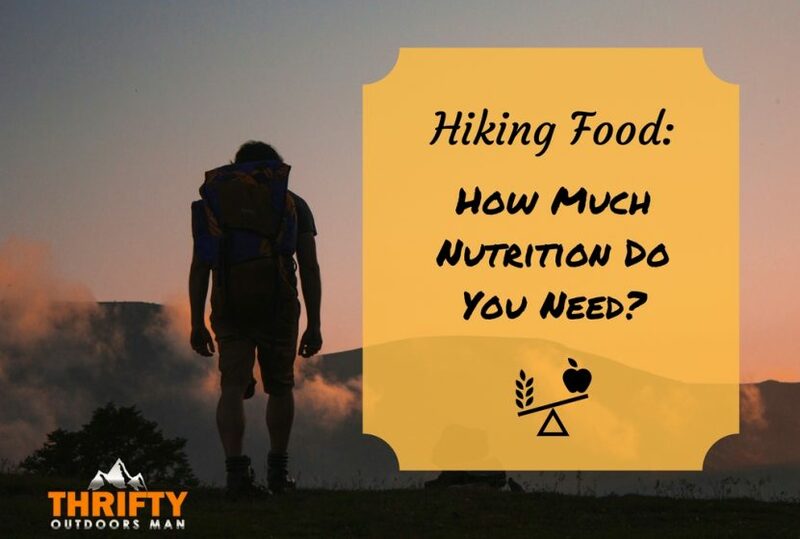 » Hiking » Hiking Food: How much Nutrition do you need?